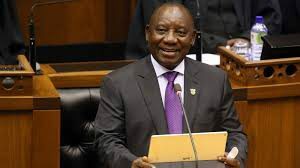 JOHANNESBURG – President Cyril Ramaphosa will address a Team South Africa (TSA) pre-World Economic Forum (WEF) breakfast meeting in Johannesburg today January 16, African News Agency has reported. A communique issued Monday, in Johannesburg, from the department of government communication and information said TSA comprises a diversity of stakeholders in the country’s society and economy and will participate in the WEF Davos Annual Meetings in Switzerland from 22 to 26 January this year. It also said the pre-WEF breakfast was an opportunity for TSA to develop an integrated approach to the country’s input into the WEF deliberations and to identify areas of emphasis in presenting it as a desired investment destination and trade partner. “The Davos delegation led by Ramaphosa will be coordinated by Finance Minister Tito Mboweni and will include leadership of government, business and labour,” said the communique.